This is something that has cropped up many times in the past, and frankly, I just don't quite see the relationship between the two. Yes, they both have red and white in them; yes, they both have stars. But two red stripes on a white field is not 13 red and white stripes, and three red stars is not 13 white stars; and where did the blue of the flag come from? Certainly not Washington's arms, which have no blue in them. To simply accept that the flag of the United States was somehow an homage to George Washington and his personal arms is to ignore the earlier striped flags used by American forces. The first Navy jack (1775) consisted of 13 red and white horizontal stripes. Some of these jacks may have had an uncoiled rattlesnake and the legend "Don't tread on me" on them. Later (1775-1776), the Grand Union flag consisted of 13 red and white stripes with a canton of the union flag of Great Britain was used by American forces. It was not until the Flag Act of 1777 that the crosses of St. George and St. Andrew on the Grand Union flag were replaced in the canton by 13 white stars on the blue canton. Given the use of these earlier flags, I really don't see a strong connection with the coat of arms of George Washington at all. Indeed, the flag seems to me to be a logical evolution from the even earlier Red Ensign and White Ensign used by the British fleets to the flag of the new nation, without requiring a vague resemblance between a white ground with two red horizontal stripes and three red stars to explain its origins. Further, if it was to be an homage to Washington, why use blue at all, or change the color of the stars from red to white? I have never understood all of the horse manure published about the purported origins of the American flag, which obviously derives from the flag of the Honorable East India Company (see http://en.wikipedia.org/wiki/East_India_Company), down to having thirteen red and white stripes, and with which the colonists would have been perfectly familiar. Hi. I am responding to your comment: "To simply accept that the flag of the United States was somehow an homage to George Washington..." Simply accept? No way. Stripes were fairly common. But stars were not. GW's family coat of arms was unusual in that respect. The fact that the stars were red is not conclusive because the colonists were looking for something new, e pluribus unum, and blue is artistically pleasing as well as being the third color in the Union Jack. What purpose is served by putting a stockade around the possibility of the stars and stripes being, among other things, homage to GW? I ask this of your readers especially in the context of pejorative terms like "horse manure". When one side has to resort to name-calling, it is clear that something is in play here other than fair-minded review of historical evidence, to which the window at Trinity College, Oxford should be added. I've been spending a lot more time on this question and I repeat my response to what you wrote. The red and white stripes are certainly familiar. But the white stars on a blue background? The only place that I can find them is in the Douglas and Moray coats of arms, in Scotland. The blue would be for the St. Andrew's cross. 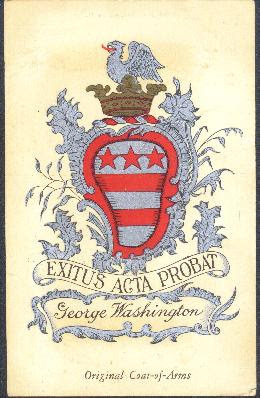 The Washington arms are similar, but are red (for the cross of St. George). Washington and Douglas were on opposite sides of the border between Scotland and England. The families would certainly have known of each other's arms. I believe that the Washington family ancestor was paying his respects to what they would have called The Black Douglas. I have read all the preachy stuff that the knockdown-the-connection people have written and I believe my explanation of the stars is better. I have an open mind. Meanwhile, I have written an article for the Oxford University alumni magazine (Oxford Today) that you and your readers might be interested in. It reviews the new coats of arms of the Oxford colleges since the war. I forget why I took down my answer to Tim of Angle, but what I would have said is that of course the stripes are easy to explain. What is interesting is the canton, the stars. No one has been able to explain their origin effectively, especially the five points as opposed to six points. I am continuing to research this subject in connection with the Durham County arms and the connection between the early Washingtons and the Bishop Prince of Durham. The example of Scotland resisting the English Monarchs (Edwards I-III) would have been a beacon for the American rebels. Using the blue of the St Andrew's Saltire for the canton would have had symbolic value.